Summer is the season for festive and refreshing (if slightly frivolous) imbibing with great friends. I originally made this frivolously festive tipple a couple years back for the adherents of the Bacchic Villa after finding the recipe in an issue of Imbibe Magazine. Apparently this marvelous potation is the creation of one Joy Richard, a member of some standing of an even more fantastic society, LUPEC (Ladies United for the Preservation of Endangered Cocktails). Unfortunately, when I made it, I was in no fit state to take a picture of the creation for the blog, so it fell last weekend to two of the four high priestesses of the Bacchic Villa, Chelsea and Amy, to pick up the slack and take over it’s preparation. Their efforts were sufficiently successful, that I wound up only remembering to take a picture after dark, but at least it’s recorded. I can also add, that should LUPEC be in search of subscribers for a west coast branch of their society, they could hardy do better than Chelsea, Amy, Brenda and Briana (the hostess for our festivities). 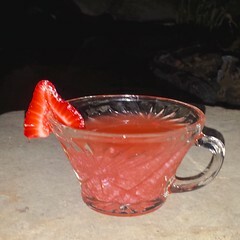 Make the strawberry syrup in advance by quartering a cup of strawberries. Bring 1 c. of sugar and 1 cup of water to a boil. Pour the boiling syrup over the strawberries. Let stand about six hours. Strain out the berries and reserve to garnish the drink. Combine lemon juice, whiskey, strawberry syrup. and simple syrup* in the bottom of a punch bowl. Place ice ring in the punch bowl. Add Champagne, Using a ladle, circulate the punch over the ice ring to chill and mix. Add the strawberries used to make the strawberry syrup and ladle into cups. We actually found the simple syrup tended to make the punch run a bit sweet, so we left it out. If it’s too tart after mixing, you could either add more of the strawberry syrup or the simple syrup at that point. Also, 6 ounces (instead of 4) of the rye didn’t go amiss either. This is a great and versatile punch, going equally well with summer or winter holiday entertaining.